What is infrared heating and how does it work? Does not take any space. IR Radiant Under Table Infrared Heating Plate is an innovative and revolutionary product that we are very proud of. With the same general characteristics as the interior plates, we have reduced its power and its size to be able to hang it to tables and desks, to provide that pleasant heat from the knees to the feet that we miss with traditional heating systems. Ideal as a complement to the central heating system of the room, or for difficult heating sites (supermarket boxes, sales or reception counters, etc). The under table infrared heating plate measures 80x40x2.1 cm and weighs about 2 kg, so can be hung to tables and desks easily. 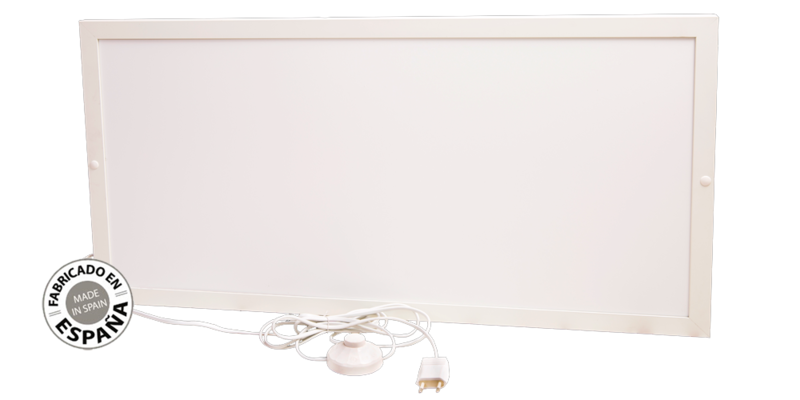 Its 240 w of power convert the under table infrared heating plate to the lowest consumption heating in the market. Any other heater used for these places exceeds 1000 w. This comes to solve the problems of the heads of maintenance of large companies when employees place his heaters, that in some cases reach the 2000 W power, firing the power control devices. Also, because we know that the safety of your home and yours comes first, you must know that it has no risk of fire or toxic emissions. Undoubtedly, a compelling reason to consider this heating system above any other. It does not produce a flame, it does not even burn at the touch. Check your doubts about this one and other products of our catalog by phone or by sending an email, and our technicians will gladly attend you.